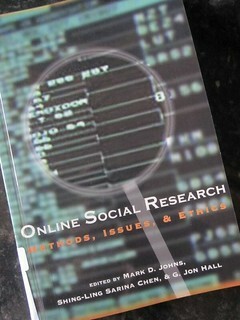 This book draws together a collection of essays on online social research brought under three main themes: Methods, Issues and Ethics. Published in 2004, the areas researched are very contemporary to the era and include MUDs, MOOs Usenet, Forums. Whilst these still exist, it would be fair to say that things have moved on in the intervening decade. Social networking sites, mobile technologies and the ‘app’ infrastructure offer up an additional and rather different set of ecosystems to explore. These new spaces are environments to which people migrated, but perhaps more importantly have offered easier and more mainstream entry points for an increasing proportion of the population. Which all leaves me wondering about the majority of the literature I’ve encountered so far and how it can inform current research. There are some universals the book covers which still apply; the differences and similarities between online and face-to-face ethnography; the extent to which the offline and online are blurring (a topic becoming increasingly significant); the importance of the approach the researcher uses when entering an online ‘field.’ The methods the authors employed during their studies at the turn of the century are still applicable now: online surveys/questionnaires, interviews, network analysis, discourse, text and language analysis. What we now have is a greater diversity of spaces where they might be applied, and arguably, a richer toolset to deploy. Another area quite rightly discussed at length and still of importance, is that of ethics. I must confess to failing to appreciate how diverse and complex an area this is. Whilst the usual considerations of ethical behaviour have to be borne in mind, undertaking research online brings a multitude of additional concerns. It is possible to ‘lurk’ online in a way an offline ethnographer could never manage. How should a researcher disclose their intent? How can a researcher gain informed consent of the subjects under study if the study is in an environment with hundreds or thousands of participants? How much more difficult it is to anonymise data drawn from the online world … or even whether it is fair to do so. The legal issues of copyright and ownership of text (and multimedia) created online, which you might then wish to reproduce in your report. I have much work to do in this area. As I move on from this book, I feel I need to seek out more recent research involving current online spaces. Are the methods currently being used the same as the ones we used ten years ago, or are newer, more effective options available? Netnography #3: Vive la difference? 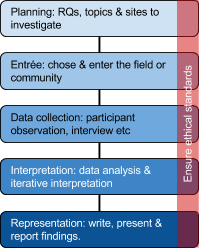 He then goes on to outline the generic steps to be followed when undertaking an ethnography. Alteration: the ways in which people interact are changed by the nature of the media which mediate those interactions. This can at times be constricting (lack of audio/visual cues, bandwidth issues, time-lag, specific symbolisms) but in other ways liberating (continual connectivity, closure of spatial separation). Anonymity: (and its close relative, pseudonymity) enable online actors to perform flexible identity management, causing difficulties for research where demography is important. Some would say however that this enables some people to portray a side of themselves which in face-to-face circumstances might remain hidden. Accessibility: once the initial hurdles of access to the Internet have been overcome, the spaces, places and people that become accessible to online actors (and researchers) are far wider than those in the face-to-face world. Mass membership on a global scale is possible, though undoubtedly lack of communality results in segmentation into linguistic, gender, geographical or ethnic sub-groups. Archiving: online interactions tend to persist long after the exchange has been concluded. This durability makes observation, recording and retrieval of data far easier than in a face-to-face context. With these differences duly noted then, we need to adapt our strategies to accommodate, or even profit from, the affordances of undertaking an ethnography using the Internet. Observation: In this post I’m taking Kozinets’ assertion that the online world demands a different set of tools and techniques – netnography – at face value and that a ‘traditional’ ethnography is somehow not appropriate or in need of adaptation. I need to think more about the fundamentals of ethnography and the distinctions between online and offline worlds. Was most of his work done at a time when the Internet and the ways we dealt with it still emerging, or in the few intervening years, have we moved on to integrate it as just another part of being? Kozinets, R.V., 2009. Netnography: Doing Ethnographic Research Online. SAGE. 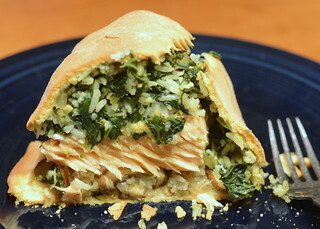 Netnography #2: Entrée … mine was the salmon coulibiac. On entering the field, Kozinets (2010:75) advocates a participative approach, suggesting that a passive, observational netnography which ‘removes the opportunity to experience embedded cultural understanding’ will have a negative impact on the subsequent interpretation. Entering the site intending to play the dual role of active member of the community and researcher requires meticulous forethought and preparation. You need to know precisely what you’re looking for, the different techniques you’ll use to gather your data and have addressed the considerable ethical issues you’ll face. Kozinets (2010:76) illustrates how easy it is to inadvertently blunder into an online community, generate misunderstanding or cause offence and have rendered any hope of being accepted by the community lost. The entrée then is crucial and preparation needs to be careful and considered. Choosing to mask your intent by extracting data anonymously or even using a different persona are of course possible, but at the very best, ethically questionable. You need to carefully plan how you will introduce yourself as a researcher, what form that will take and when, within the entrée, that will occur. Relating this to my study raises a few questions, since I am not approaching the community fresh and have been an active participant for some while. As a consequence, I’m already to a large extent encultured which of course is a double-edged sword. I already have some understanding of the norms, values and behaviours within the field site (and perhaps some credibility? ), and this might enable me to swiftly identify areas capable of informing my research questions. However the potential exists that I might be blind to elements which a fresh pair of eyes might spot, or have preformed ideas which distort my observations. Secondly, my role within the community and potentially the way I am perceived is about to change when I become a researcher. How I negotiate that transition will need carefully crafting in order to avoid the loss of any social capital I may have built up; capital I may subsequently need, to enlist the co-operation of people with whom I’m connected. Well they’re my initial thoughts; doubtless they’ll be refined and updated as things progress … but at least it will be in the open. Now I have Associate Membership of the Library, I’m able to borrow books. Yipee! I’ve decided to open with a few volumes which might inform my methodological approach or methods and have just completed ‘Netnography’ by Kozinets (2010). Whilst a post providing an overview and reflection on the messages therein might make sense, I felt I needed to get some of the thoughts it had provoked out of my mind. I suspect there might be one or two more posts to follow on this theme. Kozinets opens by making the case for netnography being a special instance of, or subset of ethnography. As with conventional (is there such a thing?) ethnography, netnography has at its core a study of communities and cultures which Kozinets uses to provide the framework within which the remainder of the book is set. He distinguishes between a ‘pure’ netnography as one in which all explorations are conducted online, gathering data solely through online techniques and interactions. A ‘pure’ ethnography would be undertaken offline through data gathered in face-to-face interactions, be they interviews, surveys, observations etc. A blended approach unsurprisingly is a combination of the two. My study will clearly begin online, but this set me thinking whether it might require a blended rather than pure netnographic approach. 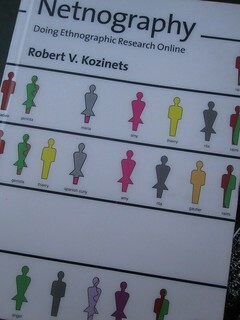 Kozinets helpfully differentiates between research into ‘communities online’ and online communities. The former are extant communities which conduct some of their interactions online, whereas the latter are communities forged online and who only ever interact online. A pure netnography would be appropriate with an online community whereas in order to capture a more holistic picture of the nature of a community online, a blended approach might be better. Unless of course in the latter case, it was only the online behaviours that provided the focal point of the study. I can immediately see a possible banana skin for me. Kozinets clearly has communities in mind when providing these distinctions. I’m not sure yet that what I’ll be dealing with could be considered ‘a community’ and need to think more about the concept of community and how that might inform my approach. Moreover, I’m far from clear whether my approach will even be “netnographic,” so I need to delve further into whether ethnographies conducted wholly or partially online are distinct from one another, or if it’s simply semantic sparring. Observation – although some of these issues swirled around in my brain for a while, I feel like I make better progress if I take the thoughts ‘out of my mind’ in order to hone them and see where they might lead. Writing seems to offer a different mechanism through which to reflect; perhaps it’s the attempt to structure the words in a particular way that encourages different viewpoints?